I saw your project on Hackaday. Awesome! 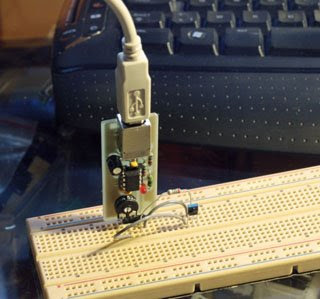 How many samples per second are you able to get out of the ATTiny ADC? Les sources du programme .NET C# sont elles disponibles aussi? Ou tout du moins un exemple de récupération des données du gamepad en C#. Do not expect more than 100's of sample/S, the bottleneck is in the HID interface. I will post the C# code soon on codeproject.com, come back to check for the link. The led should stay on. The pot act as a divider so you have to replace it by 2 resistors. it depends on how you put your res, but 47 is low and it can draw to much current, try without it. If you did not make a pcb, try to have very shorts wire between the USB conn. and the cpu there is 12Mhz around there. Also do not exchange D+ and D-! Do not use the divide by 8 fuse for the clock, only PLL internal. The device should be in your control panel in game ctrls. and identified as Easylogger. magician, i did look your picture,as you made a pcb and you say there are no shorts (check near the big cap and the under the usb socket).The problem is not in hardware.i cannot help with avrdude i use avrstudio. Double check your CPU, check the flashing, the usb cable, are you with XP ? i did not test for vista. Except the first time, ther is no message in windows when you connect and it never request a driver.Try different ports. and you connect, windows should detect something then say "not recognized" if not so there is a problem with the cable or pc usb. Thanks alot for your help, I replaced the 3.6V diodes with 3.3V and got it working!! 1. I did not have the 3.6V zeners avaialble. I just put two regular diodes in series on the 5V line to drop the supply voltage to the ATTINY45 to 4V. This seems to work OK.
2. I did not have the USB receptacle either, so just used an old USB cable with one end clipped off. The +5V line was red, the ground line was black (remember to connect shield to black), the D- line was white, the D+ line was green. Hope this helps. I am hoping the C source for the PC program will be available soon. I have been trying to get .NET to talk to my AVR-USB (now V-USB) project without success. Can you provide some references or hints of how you succeeded? My strengths are more in the embedded rather than the Microsoft domain. Have you a link to the C# source code? I can't seem to get it working, i get a message saying the device can't be recognized by windows (XP SP2). Should I try using 3,3V zeners? Could someone please post a screenshot of the fuse settings or some detailed instructions for them? I am suspecting I've done something wrong there. It´s a wonderful project, I want ask you if this project is portable to attiny15?, it is the only 8-pin avr microcontroller i can get where i live. how to program Atmel Tiny45 ? It appears someone is selling your scope on eBay! i have build your project an it runs under XP, now i have windows 7 and it do not work. Please, what can i do now. what programmer do you recomend to send code to attiny? Your project is looking very nice. I 'll try to get the same one. Thanks a lot for sharing such a nice project. what value trim pots do you use? Hi, I'm having a problem with the project, when I plug the USB the led turns on for one second and then it turns off, I can't find the problem, I'm using the 3.6V zener diode and Windows 7 64bits, I'm also suspecting about the fuse configuration. "Disabling external reset will make the ISP interface inaccessible"
"Enabling DEBUGWIRE will make the ISP interface inaccessible"
how to make ATmega8 to do it? mail me to azzura1024@gmail.com please,.. It seems like a nice project. Can you explain the 4 input pins? For what currency is it build? -no for tiny15, not enough memory. -It is ok for Atmega8,48,88... but should need a 12MHz or 16Mhz crystal and some minor modification in the code and the makefile, tiny45 has a high speed PLL wich make it run over 12Mhz, and so, the firmware can locks itself to the usb clock. look at the ASM part in the usblib from ObDev, it is amazing. -Yes, C# code IS available. -the pot can be anything between 470ohm and 470k. -if you want a 30v input, divide by 20, Rtop=60k,Rbot=3k. -it is true tat this file server is a mess. But somebody has reposted on rapidshare. -For me it is ok with W7, but not 64bits. -The 4 pins are Vcc,IN1,IN2 and ground. This would be a wonderful device to use with oScope on the iPad. ... Do you know if it would adapt? I've many problems with USB interface. Only my notebook (old Acer travelMate 290, WinXP HomEd. SP3) with USB hub recognised your hardware. In the 'game control panel' I found "Easylogger" and your application UsbADC recognise the device. With the same USB hub and cable my 2 PC's (P4 3GHz, WinXP Pro. SP3; AMD Athlon64 2,4 GHz WinXP Pro. SP3) will not recognised it. In the notebook run well only when power cord is connected! During run, in the 'game control panel' "Easylogger" disappears and, many time, UsbADC notifies "my device was removed". Sometimes continues to run fine but the USB interface will stop in 5-10 minutes. Many time I must change USB port or restart O.S. What do you think about? I've tryed to calibrate it with 1650mV DC but at minimum POT state (Rout=0; 1,2ohm misured), UsbADC show 1633mV, in both channels. I have a question, would you please answer it to my mail? it would be very nice if you do me this favor! I want to know that if it is possible to have a scope with sample rate of at least 250 sample/sec ? i mean making a scope like what you have made, using V-USB. i just want to know your opinion if it is possible or not. the only drawback for your scope is that the software is not cross platform. You should write it either in Java or an interpreted language using a toolkit (gtk, qt, etc.) and libusb. Great project nonetheless. Thanks alot! Would be nice of you to include the eagle schematic as well. That would save me some work trying to modify the design. Also a few words on the exact working of the hid-interface are appreceated. -I don't think it is possible to go to 250 samples/s. -Yes the pot can be removed. -I am sorry for the soft in .Net, but it is the only way i know how to write code to acces a hid device!. -For those who have trouble with the hardware, i must say that in some case with some PC USB host chips, it does not work. We have built a lot with my students as school projects and there is a failure rate of about 5%. Using a USB Hub generally solve the problem. Thank you very much for such nice sharing! But, here is not available ATTINY45-20, except some ATMEGA8, 88..., but also is available ATTINY44-20PU in DIP14 package. - Please do you can tell me whether and how I can use that ATTINY44-20PU in this your application, and how to connect him. Now I very need such oscilloscope solution like your, but I have not experience with microcontrolers and with programing. So, please do you can send me over my e-mail paragatidas@gmail.com or here, at least your basic directions how to make that. Could you build one for me? Can I order one from you? does anyone know if it will work with attiny2313? thanks a lot for this wonderful project!!! any possibility of getting a macosx host software for this piece of genius? anyone familiar with xcode, please?! I tried to change it to Mega8 but without good results. Is posible to give some details on what to change in software ? Did somebody did it rum with mega8 ? Also, hundreds of samples per second isn't a bit low? 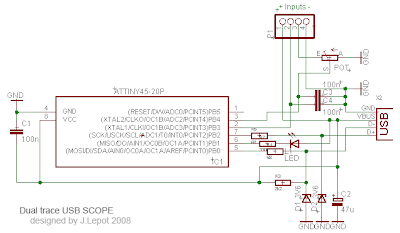 How does it compare to using a soundcard as an oscilloscope? Is this better or worst? I made one yesterday and its working very much fine. Actually i need to find the frequency of my output waveform but am unable to find it here.Also the software is in french which i dont know, but am able to use the software upto some extent. 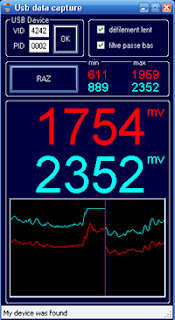 Please put up an english version of the software along with multiplier as we use a voltage divider.Also make changes to software so that it can read the frequency.. I need to find the frequency of my wave, how can i do it using this one.The oscilloscope is working fine and thanks to you for sharing it with us. Great prject, I assembly it, but when I conect to the PC, led turns on for one second and then it turns off. I Tried on XP and Windows 7 32bit. Great prject. I assembly it, but when I conect to the PC, led turns on for one second and then it turns off. I Tried on XP and Windows 7 32bit. I never hear about this part, it is amazing. The USB Driver, Firmware Source Code etc... please HELP.. THANKS for a good project.